About 65 million Americans are suffering at any time from occasional constipation and 10 million with chronic (a bowel movement less than three times per week) constipation and rely on laxatives. Learn about causes of constipation and what can you do to get relief from constipation at home. Bowel is not fully cleared. Sensation of bowel, but not coming or clearing. The most common causes of constipation include a poor diet consisting of mainly refined foods and high fat, low fluid intake and lack of exercise. Serious illnesses such as tumors. Some medications such as narcotics, antidepressants, iron supplements, calcium-channel blockers and non-magnesium antacids. Constipation is common during pregnancy. Constipation is common in the Seniors due to reduced intestinal muscle contractions and medications. Constipation Cures: What Can You Do To Get Rid of Constipation? If you are constipated and looking for a solution, analyse the causes of your constipation and try to counter-act those causes. Before taking a laxative from your Chemist, try some simple home remedies to treat your discomfort. You should not take any over-the-counter laxatives to cure your constipation as this forms a habit. You should seek the advice if the problem persists, as chronic constipation may lead to hemorrhoids, faecal impaction and rectal prolapse. 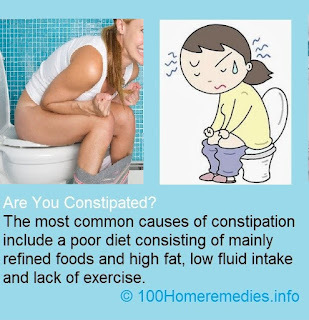 Most cases of constipation are successfully and effectively treated naturally and at home by drinking more fluids, eating a diet high in fiber and exercising daily. 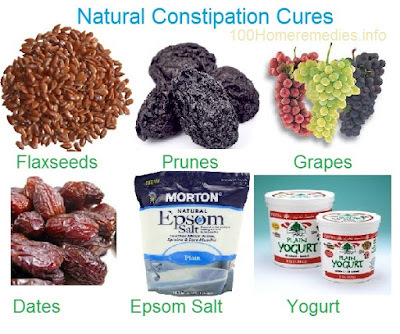 Some natural laxatives good for constipation are bale fruit, grapes, citrus fruits, castor oil, prunes, liquorice, etc. 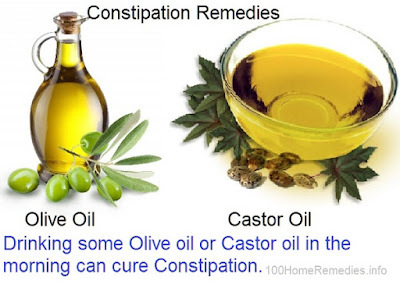 Olive oil and Castor oil, when taken orally, are broken down in small intestine into ricinoleic acid that stimulates movement through your colon, preventing constipation. Drink one tablespoon of olive oil first thing in the morning on an empty stomach. Mixed half a tsp castor oil with equal quantity of honey and drink daily to get relief from constipation. If you are sensitive or allergic to castor oil, there may be side effects including skin rashes, diarrhea, cramping and nausea so you should not use this remedy. Pregnant or breast-feeding women should not use castor oil. It is better to speak to your Doctor before using castor oil to ensure that it does not interact with your regular medications. The citric acid in citrus fruits helps flush out toxins and undigested material from the colon as it is a stimulant for the digestive system. Drink a glass of warm water with juice of 1/2 a lemon and 1 teaspoon honey in the morning before you eat or drink anything. Orange juice with flaxseeds is a popular home remedy for constipation. While orange juice adds fiber to stool, the flaxseed coats the walls of the intestine and stool, encouraging bowel movements fast. To use this remedy, take a glass of orange juice with fiber and mix 1 tablespoon of flaxseed oil in it and drink. This should work for you in about 6 hours. Just eat prunes or drink a glass prune juice at bed time and in the morning to get rid of constipation. Adjust the amount of juice according to your condition. Eating dates a natural constipation remedy. Soak 1-2 dates overnight in a cup of water. Next morning mash the date and drain the water. Drink 1 teaspoon of this water four times a day. The grapes contain cellulose, sugar and organic acid which makes it a laxative food. Eating grapes tones up the stomach and intestines and relieves the most chronic constipation. eat Eat at least 250 g of grapes daily. Raisins soaked in water can be used if fesh grapes are not available. This remedy is not for Diabetic people. Mix 1/4 cup carrot juice and 1/2 cup sauerkraut juice in 1 cup tomato juice and drink. 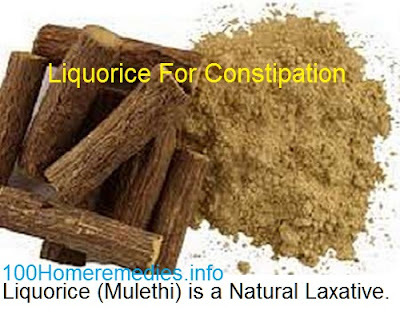 Liquorice (known as mulethi in India) is a natural laxative. Roots of licorice is one of the ancient home remedies for relieving constipation. It is a mild laxative, which helps an effective role in bowel movements. Chew a few sticks of mulethi daily. You can buy it from Indian grocery stores. Triphla is both a purgative lubricating bulk laxative, which has been used in India for the treatment of constipation, diarrhea, dysentery, heart-burn, hemorrhoids and many other ailments. 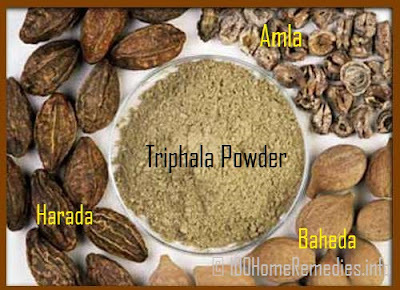 Triphala is a mixture of 3 herbs, namely Amla (amalaki, Indian gooseberries), Harada (haritaki), and Behada (bibhitaki). You can try triphla capsules from health stores. Epsom salt is an effective home remedy for constipation because the magnesium present in the salt promotes contraction of the bowel muscles, while the salt in it draws water from surroundings, which softens the stool and making it easier to pass. To use this remedy, add 1 to 2 teaspoons of Epsom salt in water or juice and drink it. The sign of bowel movement will start in 5-6 hours. You can adjust the amount of salt depending on your condition. try this only once in a week or fortnight. 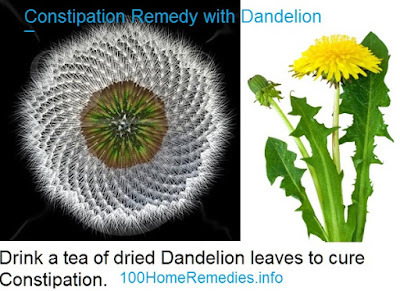 Dandelion weed in garden) is a gentle natural laxative, very beneficial to those who are suffering from constipation. Take some dried of dried dandelion leaves into a cup, and pour hot water over them. Drink it after 10 minutes 2-3 times a day. Healthy bacteria is vital to help prevent constipation and our digestive system working properly. Normal yogurt and Sauerkraut (fermented cabbage) are loaded with probiotics (lactobacilli) and beneficial microbes and fibers which improve digestion and promote the growth of healthy bowel flora, protecting against many diseases of the digestive tract. You can eat 2-3 times during the day. Sauerkraut contains acetylcholine, which encourages the contraction and relaxation of the intestine muscles that allows movement of stools. Psyllium husk has been in use in India for curing constipation from very old time. Take 3 tsp of psyllium husk (Sat Isabgol) in milk or warm water at bed time. This will over a period of time cure your constipation. Metamucil is psyllium husk, finely powdered and flavored. Several natural foods contain good amount of fiber, which is not digested. It draws water from its surroundings, causing the stool to swell and soften. Dietitians generally recommend about 30 g of fiber every day. Some fiber sources good for constipation are Apricots, Beans, Berries, Broccoli, Dates, Apples, Pears, Plums, Nuts, Cereals, legumes, Whole grains, etc. The intake of foods such as milk, cheese, white rice, white flour and red meat tend to contribute to constipation. Sitting in a squat position can help kick start your colon. The moment you sit in this natural position, your body will understand, "it is time to clear!" Always go to the toilet at the same time in the morning, even you don't have any sensation of motion. Following the routine will regulate your bowel movement after some time. Don't think that your bowel will not clear, moment you think this, you will never have motion. Always heed to natures call. Don't delay and hold if you feel like going to the toilet. The longer you delay, the harder the stool becomes as water is absorbed from it. Your constipated bowel may not clear for next several hours. 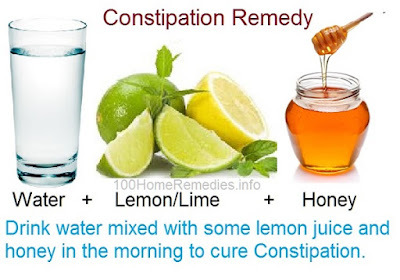 I have a very old constipation problem and I have tried all the remedies. But the habit is not forming of daily clearing the bowl. Sit in the toilet at the same time in the morning even if you don't have urge to clear bowl. Simply sitting on the toilet makes the habit.